The parish wanted to make the sanctuary more inspirational. Father had the idea that by adding “The Baptism of Jesus”, “The Transfiguration”, and “The Wedding at Cana” (in mural form) we would be completing the “Luminous Mysteries” of the Rosary. The other two “Luminous Mysteries” are represented by the two parts of the Liturgy. “The Proclamation of the Kingdom” is symbolized by the Liturgy of the word, and “The institution of the Eucharist” is symbolized by the Liturgy of the Eucharist. The murals are the only thing we added. Everything else was already in place, so we took special care that our palette complemented the existing color scheme. Designers Alan Warmka, created the Digital Color Sketch. 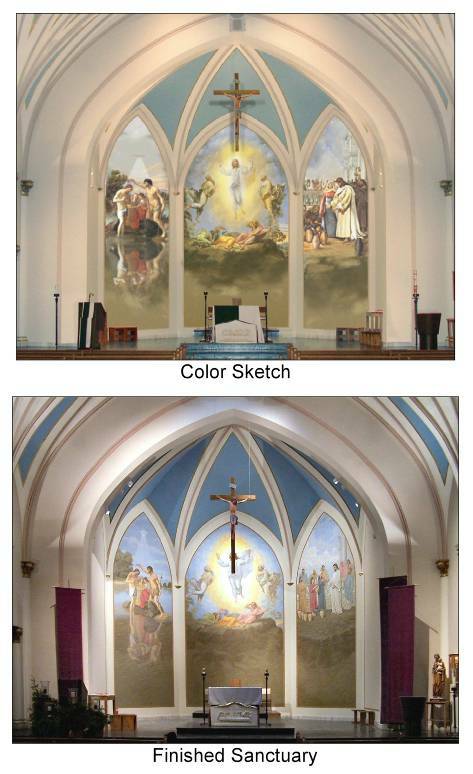 Henning Restoration did all the preparation to the sanctuary to get it ready for the murals. Each mural was painted on canvas in the studio and installed on location. 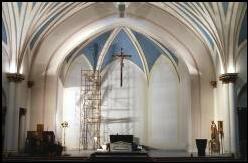 Note: The “Finished Sanctuary” picture was taken before the Crucifix was raised. Please “click” on the image to view a larger unobstructed picture of the sanctuary.